Fake cycle? Houses still selling like hotcakes! Days on Market is pointing to a boom… so why aren’t we there yet? I sometimes wonder if Aussies are getting too soft. It’s like thing are so good for so long, that people acclimatise. They get used to the good times. And when things go from mind-blowingly awesome to just awesome, it’s like the sky’s falling in. Anyway, you see this play out in property all the time. If I had a dollar for every time some junior hack at a newspaper called ‘bust’, I’d have a deposit on an inner-city town house. Anyway, let’s have a look at a piece of data called ‘days on market’. 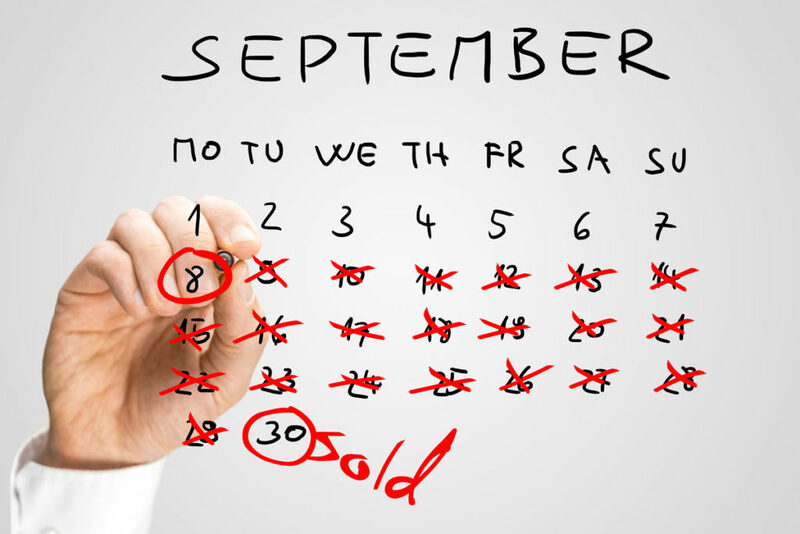 This measures the average number of days it takes to sell a property. It’s a great indicator because it really tells you when a market is hot (properties sell very quickly) and when it’s not. It’s one of my favourite pieces of data for suburb-level analysis, but it’s also useful for city by city. Anyway, take a look here at the DOM charts for Sydney and Melbourne. First up, look at Melbourne. The dark blue line is days on market. You can see that there is the very faintest tick up towards the end there, with days on market nudging higher over the past six months or so. But look at it from a longer run perspective. Even withstanding the pick up in recent months, we’re still looking at some of the lowest DOM levels since history began. Like, it has almost never been quicker to sell a house in Melbourne. I mean, based on this metric alone, we’re still looking at a boom. Sure, things are slipping from mind-blowingly awesome to awesome (there is a faint trend emerging), but keep it in perspective. Melbourne is still hot. Now take a look at Sydney (the light blue line on the bottom panel.) There is a more pronounced upward trend here, beginning at the end of 2015. But that’s mostly about how crazy hot things were in 2015. And on a long run perspective, again, 36 days is still hot. So I’m looking at this and I’m not seeing all that much to worry about. At least not yet. It is true that there’s probably a structural change going on in this data. I mean, everyone uses the internet to buy a house these days. I don’t think that was as true ten years ago. And so you would expect, thanks to technology, that it would generally be quicker to sell a property than it was before. So 29 days on market now might not be the same as 29 days back in 2004. 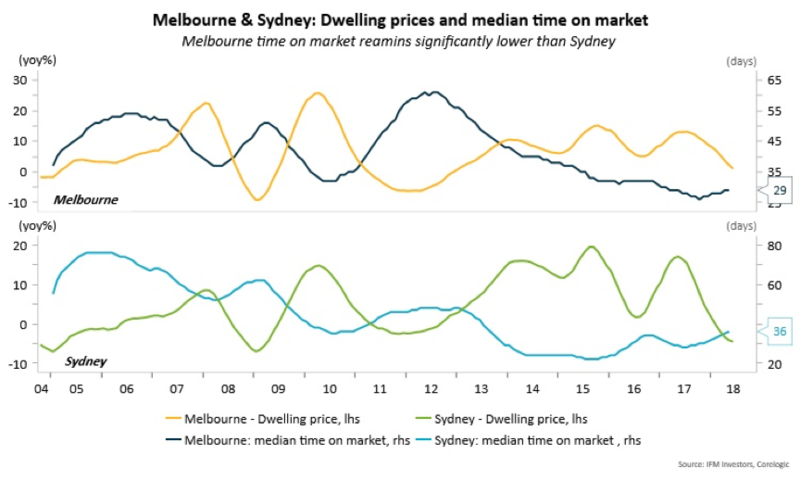 But the other thing that’s interesting about this for me is why we’re seeing prices start to slip lower in Sydney and Melbourne when DOM is still so tight. For me I think it points to the fact that this consolidation is almost entirely regulatorily driven. That is, APRA is coming down hard on the banks and the banks are tightening credit. So borrowers can’t borrow quite as much as they used to. But borrowers are still keen beans. There’s still a lot of demand in these markets. It’s just that they’re not able to hit the prices that they could of 6 or 12 months ago. And so with buyers keen beans, properties are selling quickly, just not for quite as much thanks to current credit conditions. And once credit conditions return to normal, so will demand, and so will prices. That’s a theory. What do you think? That’s how I’m squaring it all away in my mind. Anyway, more and more I think we’re looking at a ‘false cycle’. That is, this isn’t your usual market cycle. This one is all about government intervention. And what that means is that when the government steps out again, and they will eventually, the fundamentals will reassert themselves. And what are the fundamentals saying. Well, days on market at least, is saying boom, boom, boom.